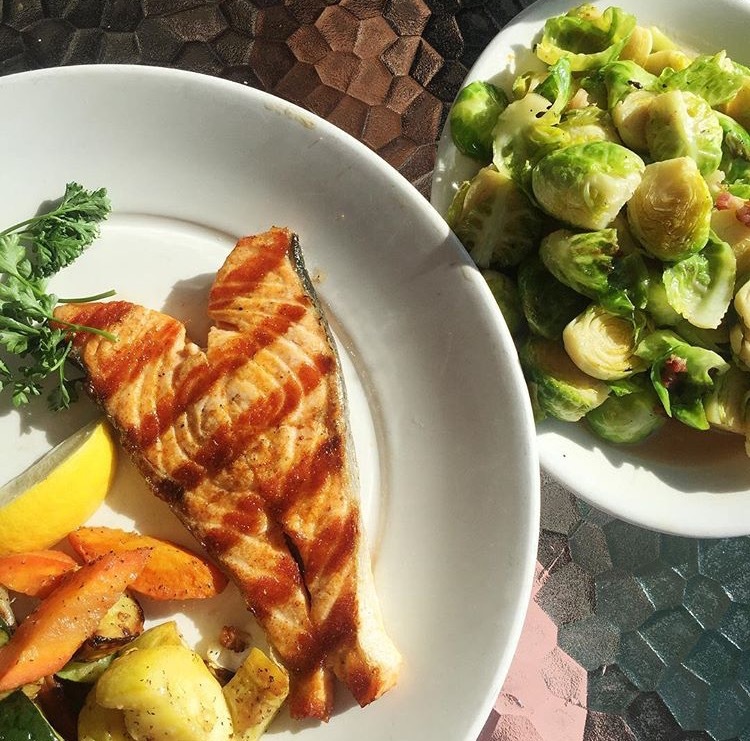 Eating Paleo at a restaurant, or eating Whole30 at a restaurant isn’t always easy. Whether you eat Paleo, are on a Whole30 or are just trying to make better decisions, when you eat a different way than most people in our society do, eating away from your own kitchen (while staying on-track) can seem like Mission: Impossible. 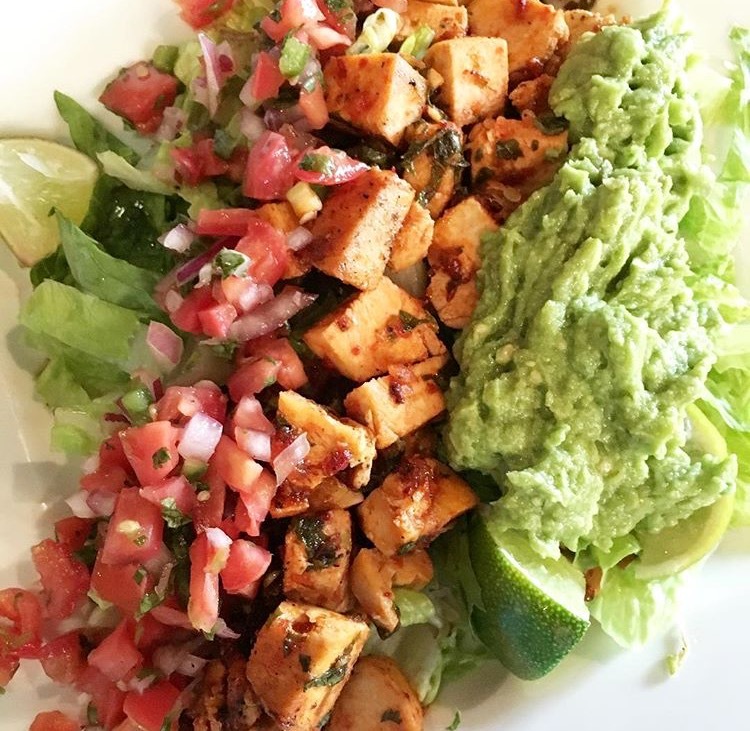 Heck, even if you don’t adhere to a strict Paleo template, healthy eating in restaurants can be difficult and sometimes daunting. I felt like a total recluse when I first started getting healthy and caring about what I put in my body. I stayed far, far away from restaurants for a long time. Partly because I didn’t trust my self-control in those situations yet and partly because I didn’t know how to go about making healthy choices when I was faced with an overwhelming menu of less-than-healthy options. Here, I’m showing you my tricks and tips on how to eat Paleo at restaurants without blowing your diet. Check out my Whole30 and Paleo Travel Tips too! Even if your goal is to cut down on how often you’re eating out, sometimes it’s unavoidable. 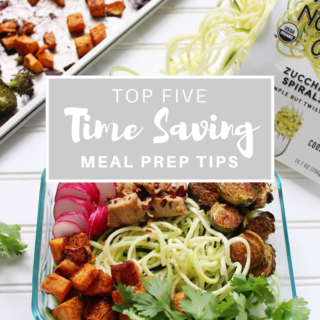 The last minute lunch meeting, a family dinner, the weekend visit from an old friend – sometimes you’ll just find your in a comfy booth with other people who don’t know about your diet preparing your dinner. A lot of our social interactions and experiences these days seems to rely around food. The goal isn’t to NEVER have the social time that going out for meals allows. The goal is to know how to make smarter choices about it than you may have made in the past. You don’t have to spend the weekends cooped up in your house or miss out on that friend’s birthday dinner. This gives you the chance to look up menus online and do a little research ahead of time. This gives you more control over the type of food that will be available. 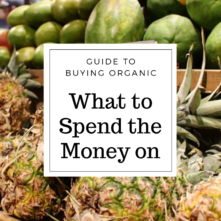 By looking through the menu options, you’ll get a feel for what they offer, allows you to think about possible substitutions you might want to make. Come up with a Whole30 restaurant plan. Pick out a few Paleo meal options that sound good a head of time. By doing this, you’re less likely to make impulse choices in the moment. Google or Yelp things like “paleo restaurants Minneapolis” “farm to table restaurants” “healthy restaurants” (for whatever city you’re in.. I do this when I’m traveling too). It’ll usually bring up a good selection of places that, even if they aren’t completely Paleo, there are things that I can make work. This is the way I find things that are Whole30 at restaurants too. 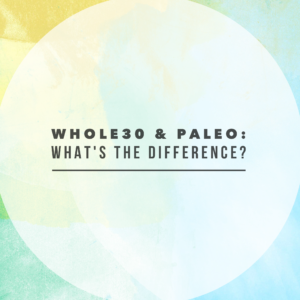 Most things that are Paleo can easily be made Whole30. After looking into what you find, offer up a few of these to whoever you’re meeting and go from there. Your server wants you to be happy and have a good experience. They’ve been trained in the menu and have more experience with it than you – so ask! This was a tough one for me to get over cause I’m a people pleaser 100%. I want everyone around me to be having a good time and I definitely don’t want to be the reason they’re not. But trust me, they don’t care. IF you’re nice about it. By now, a lot of servers are familiar with the Whole30, and probably won’t be shocked if you are trying make your restaurant meal Whole30, or make it into a Paleo restaurant meal. Nicely explain to them what their doing, and they’ll often hop in to help make it easier! I know that this grilled chicken is only marinaded with lemon juice, olive oil, garlic, salt and pepper because I asked. And guess what? Even though my server had to go check, he came back telling me he’s glad he did because now he knows too! I rarely have an experience where the server seemed bothered. More often than not, they’ve been interested in helping me, extremely friendly and happy to provide the information I’ve asked for. Make sure you show your thanks to your server with an appreciative tip! When eating Paleo at restaurants, look for menu items with simple ingredients and ask to go without the fancy stuff if you’re unsure. “Instead of candied walnuts/caramelized pear/raspberry glazed/anything-that-you-don’t-know-how-it-was-cooked, could I have raw instead please?” The answer will be yes. Same goes for ordering Whole30 at restaurants. Same with entire dishes or sides that you don’t recognize or that don’t have the ingredients listed. Stick with stuff you know or that would be easy to figure out the ingredients for or something easy to make modifications to. Simple is almost always better, especially when you’re not in your own kitchen. Bringing your own dressing with you saves you the hassle of trying to track down the exact ingredients of the restaurant’s dressings. When you’re eating Whole30 at restaurants, this can be a big issue! 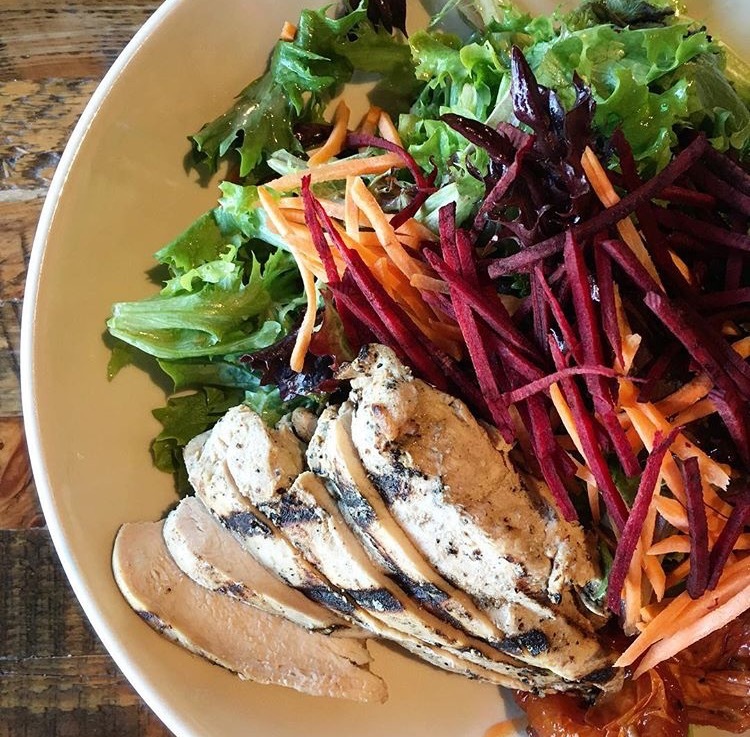 Each restaurant will vary with what sort of offerings they have, ranging from store bought ranch, creaser, Italian, etc., to house-made dressings. If you’ve looked at the menu, know it’ll be an easier choice or you just want to get a salad, this is a no brainer. Sometimes it will save you the headache of trying to get a dressing without sugar or additives by throwing a bottle of Tessemae’s or Primal Kitchen dressing in your bag (the ranch is my favorite and cheaper than on Amazon!) and heading out the door. Just make sure to put it back into your bag when you’re done. Again, if you’re nice and not totally obvious about it, the server will NOT care. Promise. Check out the individual packets of Tessemae’s that are perfect for eating out! If you can’t bring your own dressing because this meeting/lunch date/whatever just popped up, lemon juice and olive oil or guacamole make a good salad dressing. Balsamic vinegar is good in a pinch, too. Every restaurant accommodates this. Just ask for a few lemon slices and a little bit of olive oil and you’re good to go! Guacamole is also a good replacement for standard dressing that a lot of people don’t always think of. I’ve found using that helps me to fill up more on the salad so I’m not hungry again an hour later. I get burgers and tacos all the time- this means that customization is necessary. And easier than you think! The photo above shows a salad that is listed on the menu as tacos. All I had to do was ask for it over a bed of lettuce and bam. Taco salad. Tacos are actually one of the easiest things to order because it’s so simple to just ask for it without cheese and on lettuce instead of tortillas. Sometimes I’ll ask for extra pico to bulk it up a little bit, too. The same idea applies to burgers. Ask (politely) if they can do a lettuce wrap or serve it over greens. Add salsa/guacamole or a vinaigrette dressing and turn it into a burger or taco salad. One of my favorite meals to get when I eat out is a turkey burger that comes with bacon, guacamole, roasted tomatoes and onion, but on a salad with white balsamic vinaigrette instead! I’m getting hungry just thinking about it. Another option for burgers is just to simply go bun-less. It’s nice if they will accommodate a lettuce wrap instead of a bun, but even if they don’t you don’t have to rule it out. Salmon, chicken, shrimp, steak, you name it. A lot of restaurants fancy stuff up, depending on the place. They add all sorts of glazes and marinades and rarely list the exact ingredients besides the name of it. However, most places won’t have an issue if you simply ask for it grilled instead. In fact, I’ve had servers tell me before that the cooks almost prefer it because it’s less work for them to do. From the neighborhood joint down the street to the 5-star restaurant downtown and everywhere in between, grilled meat will always be an option for you to count on. We unfortunately neglect the sides menu all to often. Don’t! Show the side options some love. 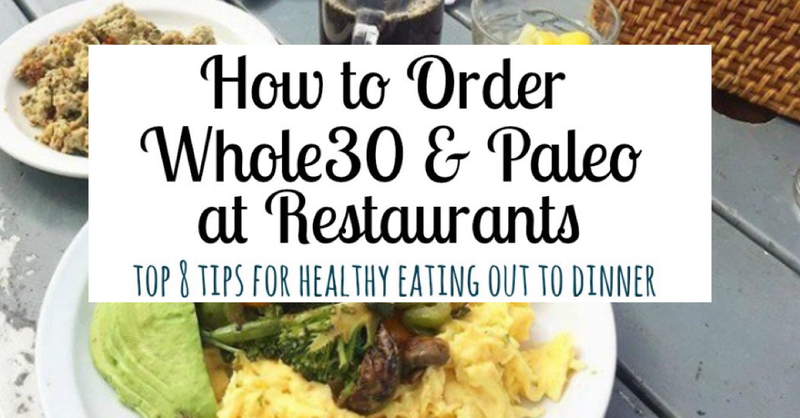 Whole30 restaurant options or Paleo restaurant options can usually be found here. Get a meat, add a side or two of veggies and you’ve just created your own meal. The veggies on the side menu are often things like roasted or grilled veggies with out much fuss added in. It’s a simple way to cut down on the questions and customizations that ordering entrée might otherwise require. I most often do this with breakfast. With how cool and trendy breakfast and brunch places are, I find it most difficult to order something straightforward at this meal time. 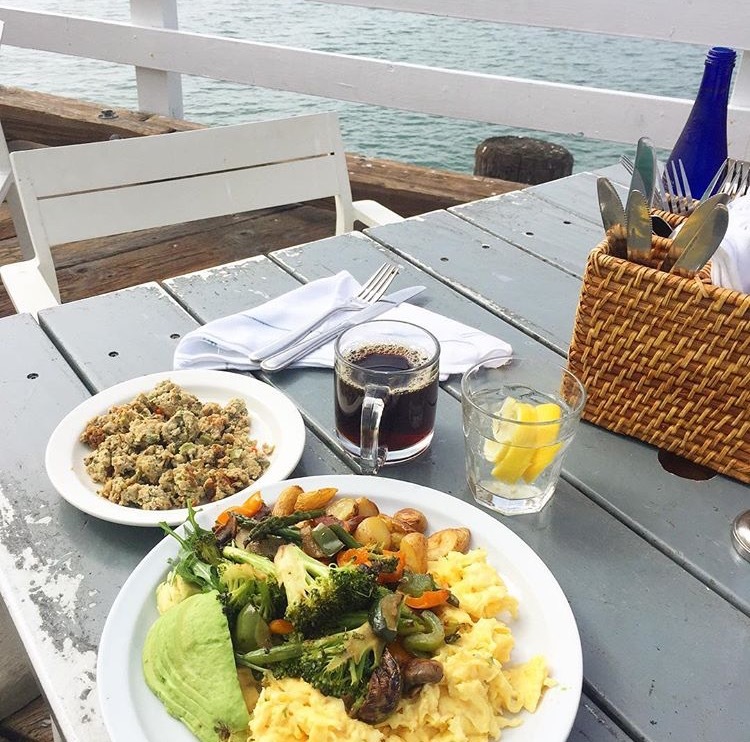 Breakfast side menus have everything you need to order up a complete, wholesome breakfast. This is true for eating Whole30 at restaurants too! 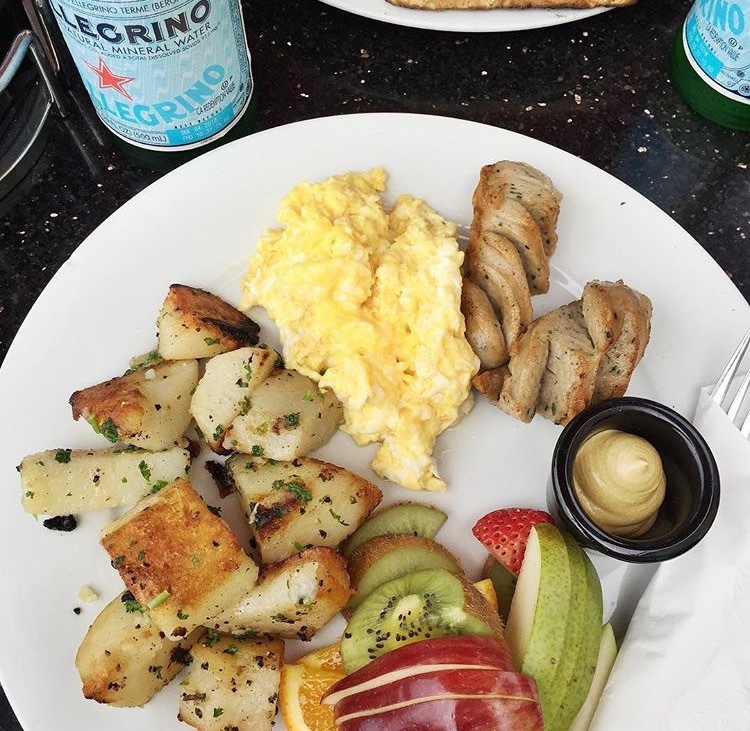 Another quick tip about eating breakfast at restaurants and eating paleo at restaurants: eggs and potatoes. Make sure to ask about how the breakfast potatoes or hash browns are cooked or what oil they use to fry them in. Some restaurants also use a premade egg mixture for scrambled eggs that contain milk. If they do, don’t be afraid to ask if they can crack 2 for you and scramble them separately. Every single place I’ve been to has been more than accommodating and willing to do that for me. Anywho, just a few tips so you don’t feel like a total lame-o when you have to decline every invite for going out to eat. You don’t have to compromise your health goals for a fun night out with friends and food! 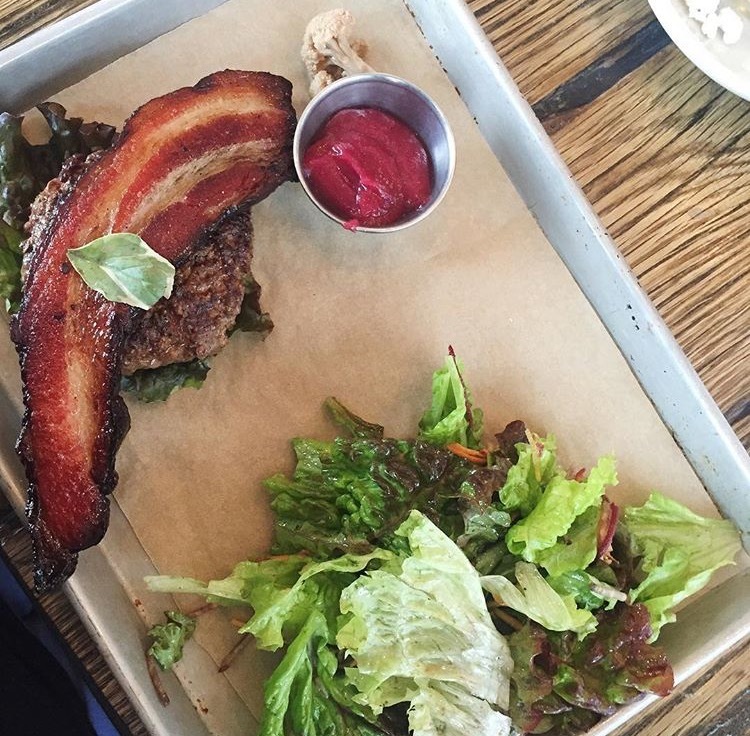 Got more tips for eating Paleo at restaurants or Whole30 at restaurants? 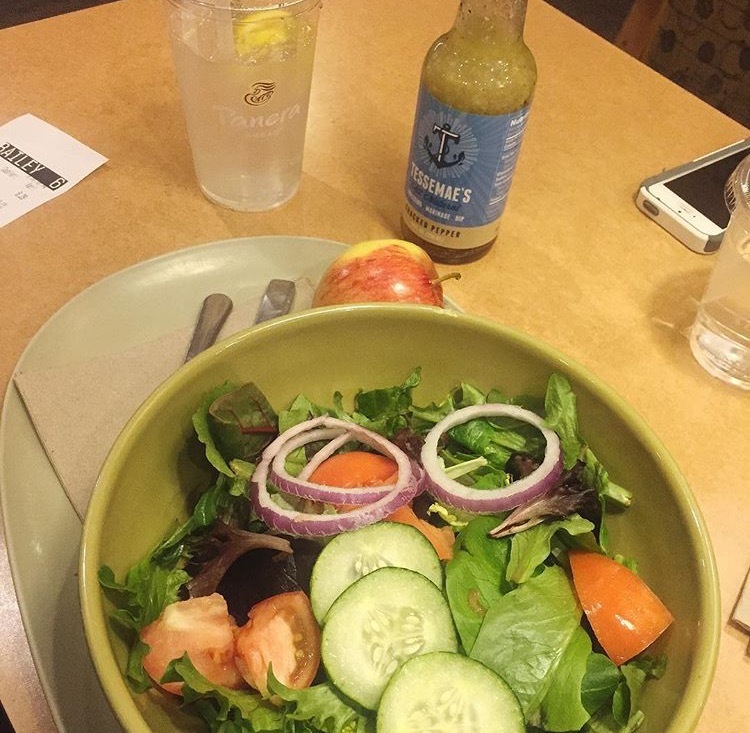 Let me know how you stay healthy while out to eat! Bailey, this blog looks great! I can’t wait to see where it goes next! You’ve been an inspiration to me since I found your Insta during during my first Whole30 in September. Thank you for your honesty with your weight loss journey. I’m adjusting to the compliments, new clothes, and loose skin during my journey as well. It’s nice to know it’s a normal part of the process. Again, thank you for your words of wisdom and sharing your authentic self. You’re helping so many people just by sharing your story! Thank you!